Posts are smaller articles that can be used for news items. Posts are organized by date, newest on top, and are displayed on the front page of the website. Aside from being organized by date, they can also be organized into categories. Categories are the easiest way to keep posts organized and usable. By default, all posts are included in the “General” category. A special category, “Event”, is reserved for events that are added to calendar. New categories can easily be added to organize your posts. To create a new post, in the Dashboard click the “Write” tab. At the top of the right hand column is the Categories box. check the boxes of the categories you would like to put your post in. 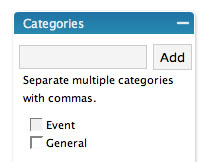 To create a new category, enter your category into the text field and click “Add”. Give your post a title. The title will be used as the headline and link for the post. Below this is the toolbar that can be used to style your text and other elements. The tools that are available are very similar to those found in many email clients. 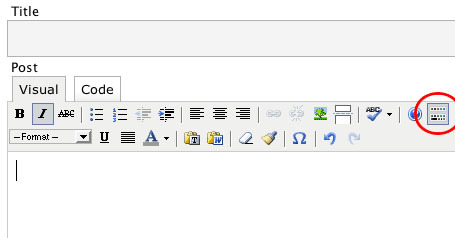 The second row is the advanced toolbar, this can be revealed by clicking the last icon on the right in the first row. You can write the contents of your post in the box below the toolbar. To save your work as you go, you click the “Save and Continue Editing” button below the text box. If you would like to save a Post as a draft and complete it later, click the “Save” button. When you are finished with your Post and you would like to make it live, click the “Publish” button. To edit or delete an existing Post, click the “Manage” tab. From the list of posts, click the “Edit” or “Delete” button behind the Post that your would like to change.